China's Huawei Technologies launched the world's first core chip specifically designed for 5G base stations on Thursday in Beijing, securing its leading position for 5G deployments in spite of US-led efforts to contain China's technological rise. The chipset, called Tiangang, will support simplified 5G networks and large-scale network deployment around the world, Ryan Ding, the company's executive director of the board and CEO of carrier business group, said at a launch event in Huawei's R&D center in Beijing. The company has now secured 30 commercial 5G contracts, over 50 percent of which are in Europe. It has also shipped over 25,000 5G base stations globally. The new chipset is claimed to be the first of its kind in 5G industry, with major breakthroughs in integration, computing power and spectral bandwidth, which can be deployed in just half the time it took to install a 4G station. These features will help lower the network deployment costs. Some Western countries which are also allies of the US have been blocking Huawei from participating in 5G construction and deployment, citing national security concerns, but the Chinese telecoms maker still has gained commercial contracts in Europe. "These concrete business deals further demonstrate its capability of delivering sound and sustainable networks," Xiang Ligang, chief executive of telecom industry news site cctime.com, told the Global Times on Thursday. The company also launched its first 5G Modem named Balong 5000, which is claimed to the most powerful single-chip that supports different architectures. Huawei's full-series-all scenarios simplified 5G products make the next generation of wireless technologies ready. "Although governments in some European countries have been considering blocking Huawei from providing 5G equipment, they won't stop local carriers choosing the Chinese telecoms equipment provider for efficient but cheaper products," Xiang said, adding that the growing number of 5G commercial contracts Huawei has won also proved that Huawei's products are in line with local security standards in Europe. Huawei began rolling out commercial networks in 2018, leading in commercial 5G products, field testing and getting ready for large-scale 5G commercial use. 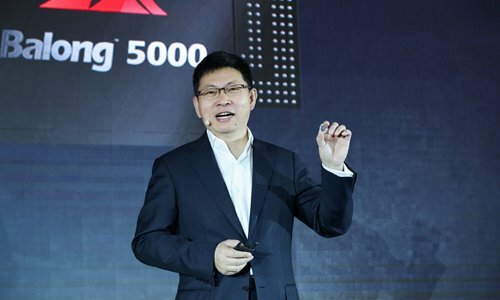 "Compared to foreign rivals such as Intel and Qualcomm, Huawei's full-series 5G engagement is a major edge," Li Zhen, an industry expert at Beijing-based CCID Consulting, told the Global Times on Thursday. "However, there's still room for the Chinese firm to catch up in terms of producing chipsets with better performance compared to other major chipmakers like Qualcomm," he said. Still, Huawei's founder Ren Zhengfei appeared to be confident in a recent interview that the hostile attitude in the West will not hinder the company's development in 5G. "Some countries have decided not to buy equipment from Huawei. Therefore, we can shift our focus to better serve countries that welcome Huawei," Ren said, noting that it can build high-quality networks in those countries to prove that we are trustworthy. Huawei is also scheduled to unveil its first foldable 5G smartphone during the upcoming MWC 2019 in February in Barcelona, Richard Yu Chengdong, head of Huawei consumer business group told the audience on Thursday. "As the company launches more 5G products, we can see the 5G era has already come into a reality," Xiang said.